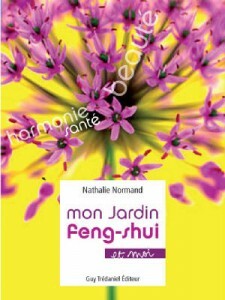 The book Mon Jardin Feng-Shui et moi bring original practices of culture and landscaping inherited from the observance of the Feng Shui tradition. One learns to harmonize the colors, the shapes, the materials, the trees and the flowers, while balancing the general atmosphere, playing with the sounds, the vibrations and the sensations. While improving the energy of your garden, you will be able to revitalize you, to uproot your worries and to create a place of conviviality and sharing. So your garden will become a charming place, auspicious to serenity and to the well-being that you search for. The Feng-Shui garden is a small paradise on earth, an islet of greenery and serenity. To cultivate it, it is necessary for us to respect the landscape and biodiversity, to preserve everywhere where it is possible the fauna and the spontaneous flora as well as the work of those that preceded us. 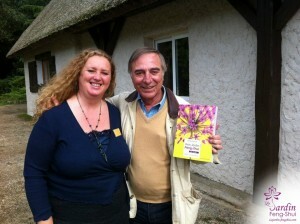 I met Nathalie during a conference of the association of the Gardeners from France at the King’s kitchen garden at Versailles. Throughout numerous “exchange-proceedings”, I could reach her philosophical universe and could discover this millennial knowing of the Feng Shui. The approach of Nature and Nathalie’s Gardening, put in parallel with our actions of defense of Biodiversity and our horticultural genetic heritage, made me understand that numerous preoccupations of the ” Citizens-Gardener” met in this original discipline in western world. The Garden is a microcosm of life, source of change, of perpetual creation, it is the place of marvels and hopes constantly renewed. We must act for the respect of the landscape and Biodiversity, while preserving everywhere where it is possible, the fauna and the spontaneous flora as well as the work of the gardeners that preceded us; while keeping the cultivated plants and the memory of our local varieties, unfortunately often in way of disappearance. 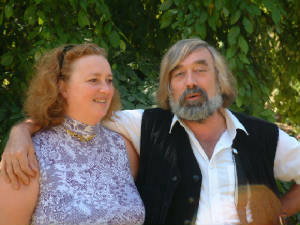 A garden is a small corner of Paradise on Earth, but also a ecomuseum that one must transmit to the future generations. “The one that cultivates his/her garden spreads happiness”, says a Chinese proverb, to work in a garden procures us a deep feeling of serenity. Here nothing is urgent, nothing is “hip”, nothing is “stressful”, it’s only life. Every plant changes, shoot, with a precise goal, modestly, while taking all its time. It is necessary to respect the place, to improve it because the garden must be evolutive, but without disrupting the natural working of it. The “historic” plants witnesses of our past and our horticultural wealth must be preserved. The real beauty is in the relation that the man establishes between the garden and the surrounding landscape. The protection of the plant diversity must be the motor of our action. What we see doesn’t correspond solely to a performance but to a riches for life.